In 5 states election results BJP won in Uttar-Pradesh and Uttrakhand with a big majority and congress in Punjab whereas in Manipur and Goa assembly in hung state. Congress is biggest single party in both hung assembly states out of five states .Samajwadi party and congress in Uttar-Pradesh as well as Congress party in Uttrakhand could not fight and lost with a big margin. In other states results congress party won in Punjab with a big majority and Anti-incumbency against Badal government. But now Question arises who was reason of this landslide victory of BJP in Uttar-Pradesh and Uttrakhand? BJP won because of Narendra Modi or Party ? After results many political analyst are talking on this question as after November 26,2014 when Modi took oath as a prime minister , BJP won in every state where Modi was face of BJP. BJP lost in just two states Delhi and Bihar where magic of BJP and Modi failed. BJP won in Maharashtra , Jharkhand, Haryana, Assam. Important thing in results is Bhartiya Janta Party came in power after leadership of modi in states where party was in third place or non-existing party. Specially in East states assam , Maharashtra , Uttar-Pradesh , Haryana and Jharkhand. Bihar Election was the only Election where BJP did not project any CM candidate and lost. How UP and Uttrakhand results will effect National politics and changes ? Uttar-Pradesh was like semifinal before 2019 election and this will effect in mindset and strategy of central government and biggest party of world Bhartiya Janta Party in big way. 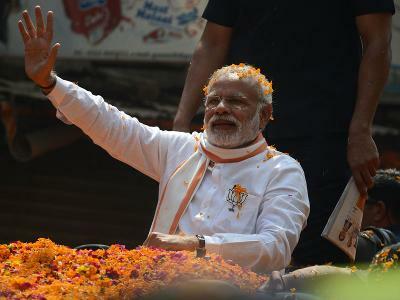 - Modi has become a biggest brand in politics as well as growing his image as a world leader. - BJP will get majority in Rajya Sabha after election results. - BJP will get enough majority for upcoming Presidential elections. - Biggest referandom in favour of BJP on 'Demonetization'. - BJP proved that way to win in elections is simply good governance and development. - With these results in state politics , power of regional parties have decreased rapidly. - BJP is saying this result as votes against AntiNational activity supporter parties as well as against those who questioned 'Surgical Strike' across borders. - BJP is saying this win as result of good governance, Leadership and work they did in last two and half years. In five states election which politics pandit consider it as semi final before 2019 elections. There were several big leaders in all five states who lost their seats .Some of them are here below. 1. Uttrakhand chief minister and Congress leader Harish Rawat lost his both seats in Uttrakhand. One seat from haridwar rural and kichha seat. 2. Goa CM and BJP leader Lakshmikant Parsekar lost his seat. He was elected CM after former CM Pariker was given central ministry. 3. Gayatri Prajapati of SP lost his election from amethi , he lost election from Garima Singh of BJP. 4. Sharmila Irom lost her seat against chief minister Ibobi Singh. 5. Ajay Rai of congress party lost his seat , he was 5 time MLA of congress and fought against Modi during 2014 Loksabha elections. 6. Amrinder singh lost his seat from Laambi against Prakash Singh Badal but he won from Patiala seat. - Modi congratulated Captain Amrinder singh and also wished him birthday. He also thanked people for big majority in UP and Uttrakhand. - Rahul Gandhi tweeted and congratulated BJP for landsliding victory. - Modi thanked in reply to Rahul Gandhi and said 'Long Live Democracy'. - Harish Rawat called his loss as Modi Kranti and magic of EVM machines. - Mayawati and Akhilesh yadav questioned EVM machines for landsliding victory of Bhartiya Janta Party. - Akhilesh Yadav said perhaps people of Uttar-Pradesh did not liked express-way and they have voted for Bullet train.